Toby Alderweireld says Southampton are in pole position to sign him from parent club Atletico Madrid but admits he is in the dark over his future. The defender is on loan at Saints until the end of the season. He has spoken of his desire to remain at St Mary's but Atletico have hinted he may return, while Tottenham are also reportedly interested in the defender. "Southampton are in a good position because I know the club," the 26-year-old Belgian told BBC Radio Solent. "They are very good to me. I did a great job for them as well so we have a good connection. I really like the Premier League. If Atletico want me back I have to listen. I can't give the answer, I really don't know." In April the Spanish club's sporting director Jose Luis Perez Caminero said they were "counting on" Alderweireld, who can play in the centre of defence, or right back, for next season. Saints have a £6.8m option to buy the Belgian at the end of the season, but Atletico can buy out that clause for £1.5m and then sell to the highest bidder or choose to keep the player. Alderweireld admits the uncertainty over his future is unsettling and he would like it resolved as soon as possible. "It's difficult for me in my head," he said. "Where am I going to live? Where am I going to play? I just don't know which way it is going to go. "I hope it gets settled quite quickly so I can go into the summer and get prepared with the team I am going to play for. "The last two seasons I've had a pre-season and then started the season with a different club so that is difficult. Maybe it's my last (home game on Saturday), maybe it's not. "They (Atletico) are concentrating on their competition. After the season the coach and the board will decide if they want me back or they want to sell me. We will see." 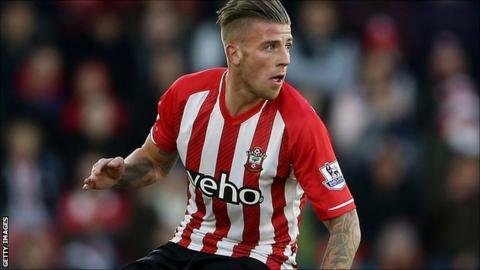 Whether Alderweireld is at Southampton or not he said he is determined to help them seal European football as a thank you to the fans for all their support. Southampton are seventh in the Premier League, a point behind Tottenham with two games remaining. Sixth place will definitely seal a Europa League place but if Arsenal beat Aston Villa in the FA Cup final then seventh place will also earn a European spot. "We have to give ourselves the present of European football for all the work we did this season," he added. "We want to give the fans a special season so they can go to Europe next season. It will be nice to give them that present."